The 2001 Queensland Biennial Festival of Music was a memorable event, immersive and provocative, remarkable for its commitment to new music, to music-making in communities urban and regional and to debate about the ways music is written about and reviewed in the media. It’s on again in 2003 with an even more ambitious program and a greater regional reach, furthering connections established in 2001, making new ones and inviting Australians to be part of contemporary music. For Artistic Director Lyndon Terracini (a renowned baritone, expert in contemporary music theatre and opera, and director of NORPA—Northern Rivers Performing Arts—in Lismore) it was never a matter of taking 20th-21st century music to the regions. Like the best examples of Australia’s developing model of cultural exchange (Elision ensemble’s international commission process, the Nigel Jamieson-Paul Grabowsky collaboration with Indonesian artists in The Theft of Sita), it’s a matter of joint effort and openness, of drawing on each other’s resources. The people of Barcaldine who made and played their own marimbas for the 2001 festival get to play again in 2003, joined by other communities and international artists. Having got to know the composer Elena Kats Chernin through the symphony she successfully composed for them in 2001, the musicians of Rockhampton (orchestra, brass band, choir) get to tackle Symphony No 2 and play No 1 again. The festival again starts at sunrise in Barcaldine at the Tree of Knowledge, with the 250 strong Barcaldine Big Marimaba Band on the same bill as Slava Grigoryan, Synergy Percussion, and percussion virtuosi Omar Faruk Tekbilek (Middle East), Hossam Ramzy (Egypt), and Ali & Adama N’Diaye Rose (Senegal). The same players feature in The Big Percussion Concert in Brisbane, says Terracini, “a 4 hour percussion and World Music extravaganza that’s on Saturday night. On the Tuesday we’ve commissioned the Queensland composer Gerard Brophy to write a new piece called Brisbane Drumming with the featured players and 100 kids from Brisbane and nearby. Leading instrument makers Elliot Hall and Steve Langton have worked with the kids to make their own djembes and tonga bells. Brophy’s written this piece for those kids and all those percussionists.” The equivalent event in the 2001 festival, also with a Brophy commission and the Anumadutchi ensemble, was a full-house, rousing celebration of music-making. The ubiquitous Spiegeltent makes its first Brisbane appearance where it will provide a centre for the festival with daily talks with musicians, some significant forums on the state of the arts, Australian Contemporary Music Market showcase performances, a cabaret every evening at 8pm and a festival club at 10pm. The tent will be located by the Queensland Performing Art Centre. 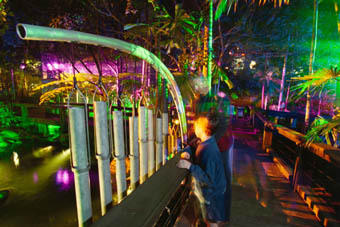 With the market stalls and the adjoining Sound Forest (an expanded version of Linsey Pollak’s hugely popular ‘instrumentalisation’ of Southbank’s Rainforest Walk) it will, Terracini says, provide a village atmosphere. Festivals need a day and night centre providing a gathering point for artists and audiences, a focus for the exchange of opinions and starting points for networks and collaborations. This is a significant development for QBFM. An important initiative in the 2001 festival was the introduction of the International Critics’ Symposium, a rare opportunity for overseas reviewers, music writers and the musicians to mingle with their Australian peers and to assess the calibre, standing and influence of critical writing. The event will be held again in 2003 at The Powerhouse, this time with Andrew Porter [UK], one of the world’s leading music critics for the last 50 years; he’s written books and translated many operas, including The Ring. Goebbels is one of the most exciting of contemporary European composers, employing a vast palette of integrated musical styles and collaborating with musicians who sometimes incorporate their own scores into Goebbel’s. His Black on White was a 1998 Adelaide Festival hit, with Ensemble Modern as both musicians and choreographed stage performers. QBFM 2003 presents Goebbel’s Surrogate Cities, which Terracini decribes as “an extraordinary symphony. It premiered in the same year as Louis Andriessen’s Rosa [in which Terracini featured]; both are large scale pieces with massive orchestration, a wall of sound, but incredibly intimate at times.” In Surrogate Cities, musical forms jostle, mixed with sampled ambient sound and texts from Heiner Müller, Hugo Hamilton and Paul Auster. The Queensland Orchestra gets to play with the featured artists who performed the work at the 2002 Edinburgh Festival—conductor Andrea Molino and soloists Jocelyn B Smith and David Moss. Terracini says of Smith that “she is an amazing singer of opera, jazz, blues and has a very high range.” Surrogate Cities was recently released on the ECM label: the Australian premiere concert is a major reason to be in Brisbane for the festival. I saw American singer, composer and dancer Meredith Monk perform with her company in Japan in 1982. Her vocal technique is ethereal, the group singing an ideal companion to the Rautavaara choral program (see below). Along with Philip Glass, Laurie Anderson and John Adams Monk is an iconic figure, and like her peers can range from the intimate to the epic, as in her opera, Atlas. She has never been to Australia. With her vocal ensemble she will perform a concert version of Mercy, an opera she wrote about compassion and refugees with Ann Hamilton. Terracini admires her as a key initiator “in the whole minimalist movement, before Glass, before Adams and with work characterised by an absence of words. It’s wonderful the way she expresses sounds, expresses the exact meaning of what she wants to say…it is an amazing experience to be at a Meredith Monk concert.” For those readers who have experienced only the more ethereal Monk creations, Mercy is an overtly passionate work, dark, sometimes raw and certainly moving. Elision, the internationally acclaimed, Brisbane-based new music ensemble is back from Europe with many plaudits for its opera, Moon Spirit Feasting, and its massive music installation, the Australian-Norwegian-British collaboration Dark Matter. Their QBFM concert is titled Burning House after the work of the same name by composer Liza Lim for solo voice and koto on a program with works by Richard Barrett [UK] for electric guitar and live electronics and John Rogers for water dripping crotales and dog whistles, plus a new work from Melbourne saxophone virtuoso Tim O’Dwyer. One of the major composers of orchestral music and opera of the moment in Europe (though little performed in Australia) is Einojuhani Rautavaara. He is one of a number of notable contemporary Finnish composers, certainly no longer an avant gardist he forever expands orchestral possibilities in the tradition of Sibelius, Shostakovich and Holmboe with uncommon melodic invention and dense and stirring string and brass textures. Like many a Baltic composer he revels in writing for a living choral tradition. His Vigilia and a selection, Sacred Works for Mixed Chorus, both available on the Ondine label, reveal a theatrical vigour, innovative orchestral-style layering, moments of sheer transcendence and an absence of the church choir mustiness some audiences fear and avoid. The 30-strong Kampin Laulua choir from Finland perform the sacred music of Rautavaara for the first time in Australia at St Mary’s, the politically progressive church a few blocks back from QPAC. Terracini has commissioned a second St Mary’s Mass from Australian composer Stephen Stanfield: “I wanted to do this at a time when very few composers are writing for the church, and the last one, Critical Mass, about homeless people, was incredibly successful. This one is called We Choose and features the Queensland Choir and the Symbitronic electro-acoustic ensemble. We also have a choir of refugee children in a concert called Alafiah, a creole word for freedom, in a range from symphonic to hiphop and pop in a concert they share with Australian-born kids at Brisbane’s Powerhouse. They have a CD out called Scattered People. The Gonzalo Rubal Caba/David Sanchez Quartet are giving their first and only Australian performance at the 2003 QBFM. “All of them,” declares Terracini, “are frontline players.” The highly-rated pianist and saxophonist are joined by drummer Ignacio Berroa and bassist Armando Gola. Terracini is very proud, and rightly so, of this latest development, an Australian Contemporary Music Market in partnership with the Australia Council’s Audience & Market Development Division. Although an admirer of the bi-annual Performing Arts Markets, he says, “My feeling was that music had been badly served with a 20 minute Spotlight performance. By the time the musicians have set up it’s time to pack up and leave…and the venue wasn’t particularly conducive either. This market is only about contemporary music and we’ve invited 15 of the major programmers from all over the world, from the Barbican, from Southbank (London), BAM (New York), Germany, Singapore…they’re coming to Brisbane specifically to see Australian new music in the Spiegeltent at 5.30 every evening and they’ll see 40 minute showcase performances. There will be stalls outside and artists and companies and organisations and state arts ministries will be represented. The festival program also includes a Prokofiev celebration with Stephen Savage playing all the remarkable piano sonatas, 2 days of electronic music from the Melbourne-based Liquid Architecture Event (with special guest, international sound innovator Bernard Parmegiani), Small Black Box (Brisbane’s experimental sound listening space), the ACO premiering Carl Vines’ Pipe Dreams for Flute & Strings, Sound Builders (Instrument Makers Exposition) and, for the first time, the National Music Therapy Conference. In towns and heritage houses and woolsheds across Queensland there is a wealth of performance from locals and festival guests. Terracini is a keen commissioner of new works and has built the commissioning process into his festival so that its legacy goes beyond recollections of inspiring concerts and events. Communities will own works that they can play again, locals will become musicians inspired by the instruments they’ve made, and towns, it is hoped, will develop their own contemporary music programs. In Winton, locals will collaborate with hands and voices with Graeme Leak to create a musical fence, which they can play but which also can be played by the wind alone on one of the flattest landscapes in Australia—an installation that will become part of Winton’s heritage. In 2003, Terracini has also commissioned a new didjeridu, a film about its making and a symphony from the maker and composer, William Barton. Terracini explains: “Young Indigenous composer and didjeridu maker William Barton is from east of Mt Isa. [He went to] his tribal land to find a tree and to make a didjeridu from that tree. And we sent a filmmaker, Brendan Fletcher (Black Chicks Talking) with him, camping out for 2 weeks, and William made the didjeridu in the traditional way. The film will be shown at the Singsing Bilong Pasifik exhibition of the musical instruments of Pacific peoples at the Queensland Museum. William will play the didjeridu to launch the film and the exhibition on July 19.” Roland Peelman will conduct the premiere of Barton’s Songs of the Mother Country, a fusion of traditional and contemporary music, at The Lagoons & Mackay Botanical Gardens on July 26. Terracini regards the premiere as a unique moment for Australian Indigenous music and for this composer.